On the LMA listserv, someone asked how much should be spent on advertising and public relations. The answer, as it often is, is there's no single "right" answer beyond "it depends." As one of the few marketers who has spent a significant amount of time in both the Public Relations and Advertising areas (my first three years full-time at Winston & Strawn was as "Public Relations Manager"), here's what I see. First - exercise great caution in BOTH areas. In my opinion, and I'm probably going to over-generalize here - most of the money spent on monthly PR retainers AND traditional image advertising is wasted. That's right - wasted. This is a tragedy, because done well they can be two of an organization's most potent marketing weapons. It's just that as they're typically used, they're simply not. First, don't believe the self-serving studies many PR agencies routinely conduct that "prove" that PR is the most-persuasive and most-credible tool after personal referrals, while advertising always ranks at the very bottom. Only an idiot would respond, "Yes, as a CEO, I hired my law firm because I saw their general print ad." That doesn't mean that subconsciously it wasn't persuasive, it's just that no smart person would ever admit it - either to themselves or to an interviewer. These same people claim they drink $4 bottles of water because it tastes better, not because they bought into that industry's marketing. So does advertising work? Yes, but only when it's great. Not "good." Not "very good." But absolutely jump-off-the-page, grab-you-by-the-throat "GREAT." 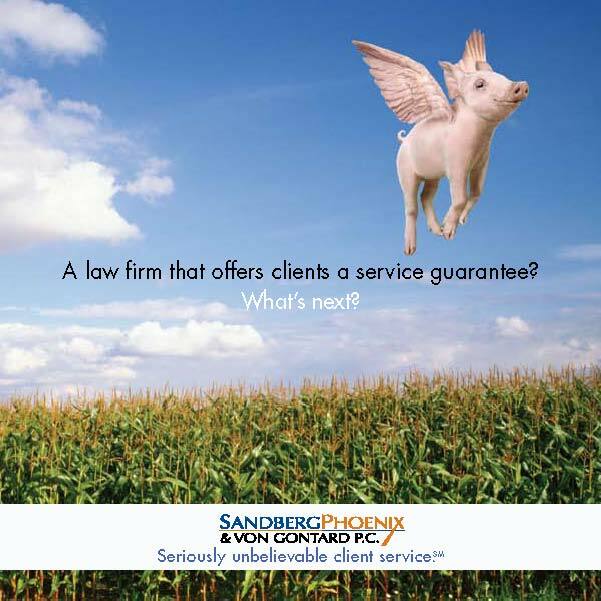 Most advertising, law firm and otherwise, isn't great. Most isn't even "good" -- either because the agency (1) wasn't good enough, or (2) couldn't keep the marketing committee's red pens from editing the effectiveness out of it. So, if you're not ready to be great, save your money, don't advertise, and spend your money on something that could work. I can show countless examples of firms where we've advertised the firm into market dominance quickly, because with a great ad and well-read publication you can guarantee that people see your message. But only where firms are willing and able to let it do its job. Advertising lacks the credibility of public relations but you control the placement - with PR you have no control whatsoever over the content or location. Therefore, with PR, you have to (1) hope you get quoted, (2) hope it's a good quote, (3) hope your audience sees the article, (4) hope they read the article, and (5) notice the quote by the lawyer in a middle paragraph whose firm isn't identified, and finally (6) remembers his/her name months later when they need a lawyer in that practice. Try this exercise - name one professional of any sort who was quoted in a print or online article you read today. Obviously, we create lots of advertising and marketing campaigns for law firms, but I truly believe in the potential power of public relations, and strongly recommend it to many of our clients where it is the right tool for the job. 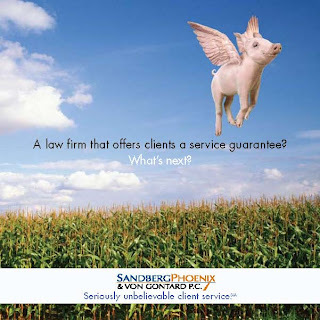 Yes, there are some great publicists doing great work consistently for their law firm clients. However, there's simply not that much real news that's available for publicity in any law firm, and PR agencies must justify hefty monthly retainers by churning out a thick stack of regular placements. 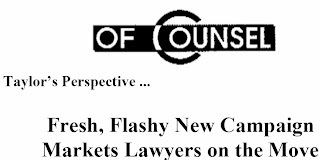 Critically analyze how many of those little blurbs quoting the lawyers are in inconsequential publications with limited consistency or repetition. That is, there's often no focus, just random quotes created so at the end of the month the agency can show lots of activity, and The Quote Book makes an impressive, echo-y "whomp" sound when they drop it on the conference room table. Lots of miscellaneous quotes spread across many different publications doesn't build anyone's business or reputation, but, at $5-15,000 or more per month, the retainers can quickly chew up a marketing budget. If you have both a great message and a specific target audience, PR can really help build omnipresence, especially when narrowly focused like within an industry or specialty area. Arm a great publicist with that goal and the media can become a powerful ally. It's costly, but can be worth the expense. But that's you should always start - if you can find or create a great strategy and message, of course the media will write about you, they're always looking for good stories. (For example, here's a link to a 1200-word feature profile we recently pitched about a small firm we just started working with: http://tinyurl.com/27jngzu). The firm was already legitimately interesting, so we generated a feature story with just a couple quick phone calls. Without a unique hook or story, you're doomed. The PR you'll be able to generate will be as big waste of marketing dollars as advertisements that are too small, too infrequent, or too bland to have any hope of being effective. In short - if you have a great message, PR can be a powerful tool, but use it wisely, narrowly, and with a specific goal. With ads, if you can create and execute a focused, strategic, and visually stunning campaign, then spending a lot of money can also make sense.